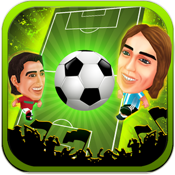 Soccer Fighter is a high-quality 3D football game. Play football like Street Fighter, but much more relaxed. Shoot as fun as 2D scroll game. Use the awesome super skill to win the match. There are also various props come out randomly, which will make the game much more fun. The multiplayer mode allows you to fight with your friends. You can even start the battle between iPhone and iPad. - Universal-App for iPad, iPhone and iPod. - 3D cartoon style characters. - Very easy to control. - Multi player mode. Battle with your friends in two devices. - Multi characters, increasable skill points. - More levels, more challenge. Most of the football games are too complicated. You have to manager all of the players. In this app, you might totally focus on heading and shooting the ball. Follows us on http://twitter.com/108kmStudio for tips, help and special offers. Produced by 108Tech co., ltd.